Please be aware that this website was damaged by software changes in November, 2016. It appears that this website will continue to be sporadically attacked as it occasionally has been for years. In any case, I will keep the site up for as long as possible and make corrections and changes when able. I have been very blessed to get the images I have been getting over the past several years. One of these days I need to upload some of my spybee videos...that's a long story by itself. This is a cropped photo taken in the wee hours of January 28, 2009. I am getting activity on an ongoing basis, even unto this day; mostly normal orbs, of course. There is no real way of proving just what the photo to the left really is (But, I do have my own guess...wink, wink!). Of course, the word "angel" is verboten in scientific circles. Despite the image of this probable etheric being exceptionally fuzzy, I'm still quite impressed if I say so myself. The weather on the day of this photo was quite cold and the street was completely iced up. It was taken at the place I was living at in Columbus, Ohio in early 2009. Below are two simple enhancements I used from Photoshop 2.0. That immediately below is the "Fix Lighting" version of the above photo, followed by a "colors inverted" (negative) version. 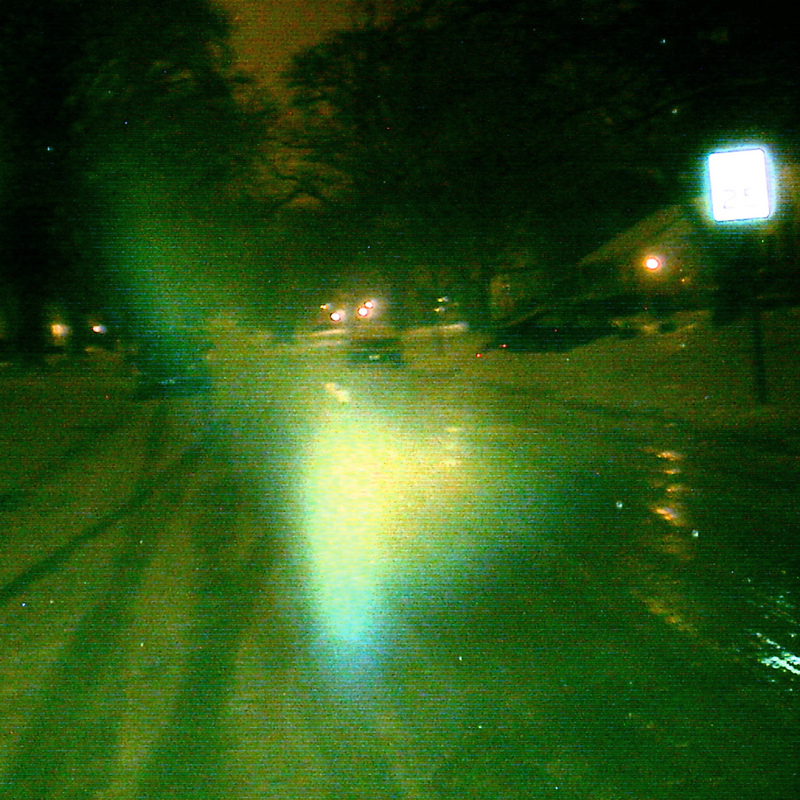 These orbs were imaged on Jan 10, 2009. Once again, this is about the same spot where I was standing when I imaged the "angel" above a couple weeks later. You can see a faint orb to the right of the "face orb" in the photo on the right. The photo at the left was facing toward my house. The photo at the right was taken a few seconds later, and was directly behind me. The tiny white spots are sleet. It was sleeting a bit at the time these photos were snapped. As always, I did not see these things with my own eyes. The photo on the left is among the brightest and most opaque orbs I have captured. It is also not the usual spherical shape. The photos below are enlargements of the face orb. These photos were taken late at night (as are most of my orb photos), and the snow cover was quite thick. Trying to enlarge this too much probably does not help as the photo will only pixelate and the object of interest will be less discernible. But, the implied "face" here is still quite discernible. Way back in mid-2008 when I first started imaging my own orbs, I had no intention of making much of an issue of them on this website as they were just one more in a GLUT of things I had to deal with. As it happens though, orbs are now incredibly common which should make one wonder why that would be! Since I started posting them I have been catching flak about them. So, I have decided to go ahead write a little about my guesses as to what they are. So what the heck. For my part, I'm certain that the expanded appearance of the orbs and other etheric beings ties-in with the massive increase of paranormal activity that has been going on (to anyone paying attention) since the mid-1990's. This general rise in paranormal activity has been expressed by far the most with increasingly larger numbers of photo and video images of various unusual things, with the orbs pretty much leading the way. Beyond that, I don't exactly know why the orbs are so abundant, but it could be that they are the most available paranormal entity in our midst (Certainly in my midst anyway! ). When it comes to the orb photos themselves, I'm really quite certain that the images really are of something that is registering on the substrate of the camera "eye" with digital cameras. Something is obviously reflecting the flash of light which comes from the camera! So, the question at hand is what is that "something" which is being imaged? I know that these things are real; I witnessed an orb briefly on two occasions in early 2010 (that's another write-up for later). There were (or are) some videos floating around on YouTube showing orbs without the use of bright light. That most important ET group which I refer to often on this site --the Plejaren ET's-- relate that there are two forms of matter: Coarse Matter and Fine Matter . Coarse Matter comprises the elements that are the material Universe around us when we are alive. When we die, our soul (which they call spirit) goes into the realm of Fine Matter, which I would contend to be what used to be called etheric in the 19th Century literature; like ghosts for instance. I am now certain that these orbs are of the etheric realm and the Plejaren ET's have stated that they are indeed real (rods as well, incidentally) and that they are live beings (could they be spirits of the dead?). The very idea that these things can not only be observing us right in our midst, but are invisible to us as well is an entirely different discussion that I expand on a little in the paragraphs below. The degree of reflectivity of these things varies, but usually they will be faint and I won't be able to see them on the LCD screen of the camera (when snapping the photos). In most cases, the only way I know if anything was there is when I upload the photos to a computer and view them in greater detail. 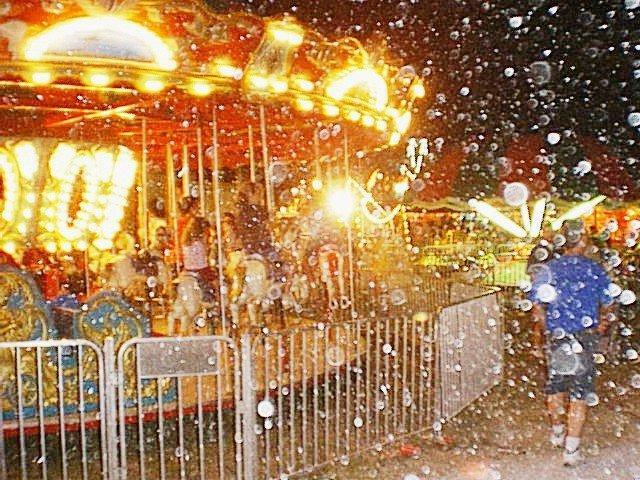 When I get multiple orbs in a given image you can see from the photos on this website that they all seem to have varying degrees of reflectivity. This would suggest that they are in varying levels of depth-of-cloak. This depth-of-cloak appears to be rapidly changeable. This also would imply that a highly developed intelligence is involved. Actual film images are comparatively uncommon as film has gone out of style, to say nothing of that fact that it would be enormously expensive to try and capture etheric beings that way. The way I get my digital images is to take as many photos as possible and then look at them in more detail when I download them to a computer. Photos with no orbs can simply be deleted; with film, that would be money out the window. Bear in mind that reading what I say here, one must first understand that for the time being there is no remote hope of proving scientifically anything I write here as it pertains to the ideas I have regarding orbs and other etheric beings. There is simply no current science that will support the reality of etheric matter. This is like so many other things that relate to the field of the paranormal. If "they" admit to so much as one thing, then that opens the flood gates to discussion of other things our ruling Masters don't wish us to know. I am quite certain that the entire range of ghost phenomenon, various apparitions, and so forth, are also related to this same category of etheric beings. There are a rare few videos which I've seen in the recent past where a ghost would come out of a wall, take a few strides to the next wall, and then continue to walk into the wall as if it didn't even know a wall was there. But, that is a rare video indeed. So far as I know, I don't have any photos showing an orb part-way into a solid object. In my "room orb" photos I can't really tell if they are three dimensional objects, or are more like a two dimensional projection on the wall. There's really no way to tell with certainty. Likewise, the exact size of these things is another area of uncertainty since there's no way in a two dimensional photo to tell exactly how far or close to the camera these objects are. Perhaps these kinds of issues can be sorted out in the distant future. Images of etheric beings (orbs, rods, etcetra) are meaningful except when they are hoaxes. Hoaxing of this kind would be really difficult for just normal folks with normal digital cameras. So far as hoaxes go, I'm pretty sure that can be done, but it would take some fairly sophisticated software that would be available only to a veryt sophisticated operation like the CIA or NSA. 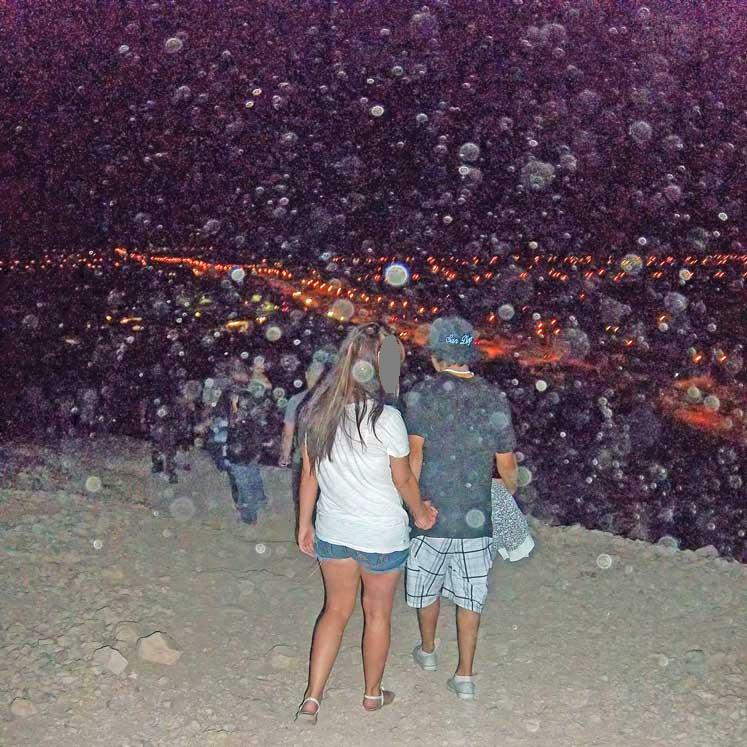 It would be easy for them to overlay orbs and such things on any digital image. For my own part, it is just a heckuva lot easier to point the camera almost anywhere and take an image ...and lo and behold, there they are! No hoaxing needed whatsoever! The upshot of all of this is that I will not be entertaining theories on the non-existence of these phenomena. The existence of these kinds of phenomena would go a long way in explaining where the mythology of "angels" and other strange things have their origin. By the way, these etheric beings can make themselves visible! I witnessed an orb in daylight in my room on two occasions in early 2010. That is the only time I have had this happen to date. Orbs and other etheric beings; but what does one do? On this particular issue I can only say that I HAVE NO IDEA as to a useful "What To Do"! I am truly stumped as to why the orbs and other etheric beings are putting on such a show for me personally! Of course, it's not really just me alone. Orbs and other etheric beings are putting on a show for a lot people worldwide. Probably anyone could get them if you really try. All one has to do is just take random shots virtually anywhere and then see if they show. Sometimes they are there, but most of the time not. In my own case, it seems there is almost always an orb or two around. These two photos were taken somewhere in the vicinity of Las Vegas during July, 2011. 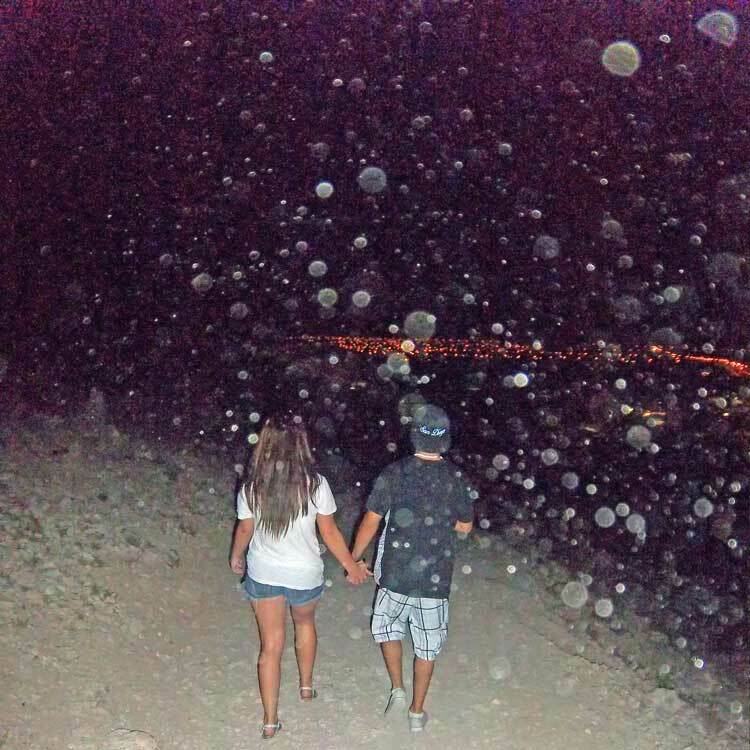 Both of these photos were taken by a person who was not into orbs or the paranormal in any way. This pic and the negative version are courtesy of Gil McDonald, a Facebook friend; so, they are re-posted here with permission. Thanks Gil! 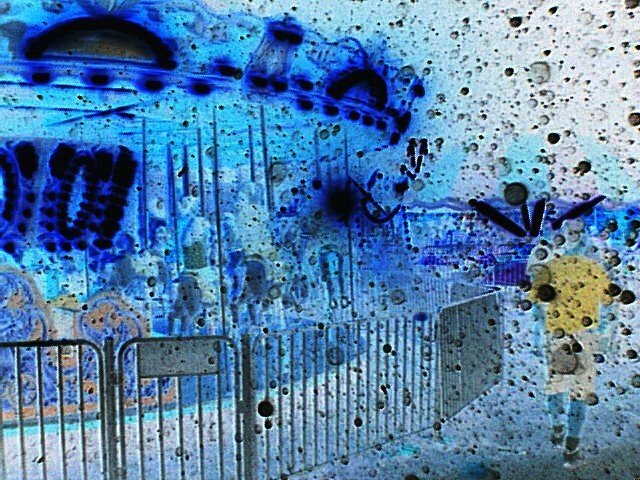 This pic was taken at the Cole County Fair, Jefferson City, Missouri, probably in 2004.